Princes Christina, younger sister of the former queen of the Netherlands Beatrix, is known for keeping a low profile, this apart from hitting the news when she has invented yet another artifice to enlarge her financial estate using creative ways to avoid paying taxes on it to the Dutch state. She is not only a creative woman in the realm of finances, but also in art. Latest spectacular event being the auction of a splendid art work from her private collection, a drawing by the famed painter from Antwerp, Rubens. At first the work was valued below one million dolar, but by leaking the pending sale of this work at Sotheby’s New York to the Dutch press, which caused a scandal in certain museum director’s circles – who would have wanted to buy the work for an under the table price – such apublic publicity fuss was created that the estimated value of the work more than tripled even before the auction took place. In the end the price at auction was tenfold the initial estimate, 8,2 million dollars, but… this is not the end of the princess and her artistry in economics. She had not failed to notice the sensation of the shredded work during auction by the British artist Banksy at Sotheby’s London, fall last year, how his shredded artwork of ‘the girl with the balloon’ had been recreated at auction. 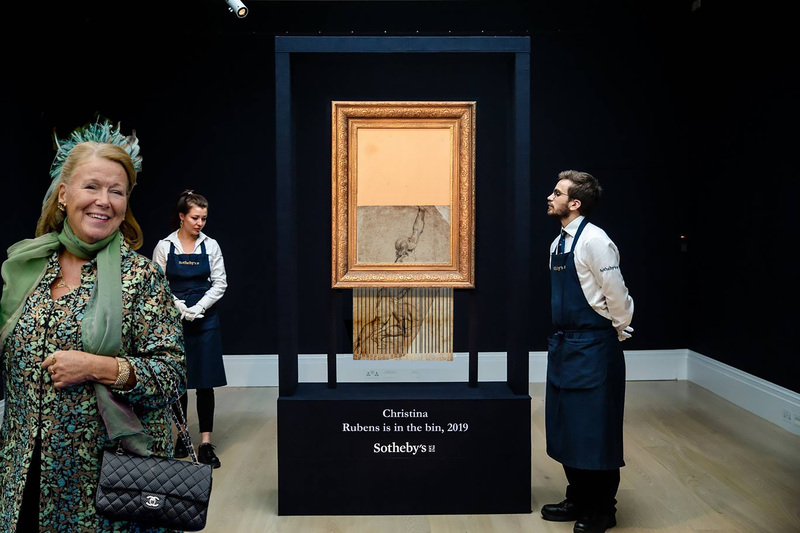 Sotheby’s London did put the work on show in its half shredded state presented in a construction specially developed for it. Princess Christina had been thinking a lot about this historical event and as she has a highly developed sense for art and money she decided to do the same. As said she tends to keep a low profile, so shredding of the work was not during the auction, but straight after… like her great example Banksy who did not destroy an artwork, but created a new one, baptised “Love is in the bin, 2018”. Christina had her work shredded as well by Sotheby’s New York – be it as a private event – and named it accordingly. The price estimates of this new work made by a Dutch princess are not yet known, certain is that there is a large clientele for such a royal work in the circles of art loving oil sheiks and their museums of modern art. If she had been buying her own Rubens drawing with her own money to turn it into a work of art by herself, we do not know, still this private photograph has been leaked to me and I am proud to offer it to the world to honour the creative ingenuity of this priceless princess.